Congratulations to our Arkansas RISE Academy graduates! . 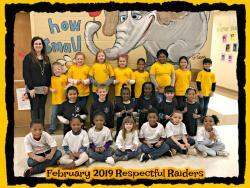 . .
Congratulations to our March Respectful Raiders! 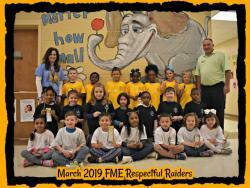 These students have shown that they always practice good citizenship and are a shining example for all students. . . . Thank you to the countless students who donated their spare change to the library during the book fair. All the names went into a drawing, and these five students each won a free book! . 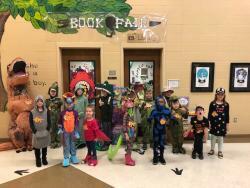 . .
We kicked off our Dino-Mite Book Fair with a Dinosaur Costume Contest! 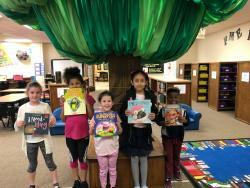 All students who entered received a free book from Mrs. Hogan, and the top three winners won gift certificates to the book fair. . . .
Congratulations to our February Respectful Raiders! 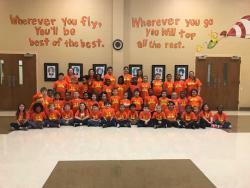 These students have shown that they always practice good citizenship and are a shining example for all students. . . . Thank you to everyone for supporting and participating in our Dr. Seuss Week activities! We ended the week with Birthday Cake, and students even dressed up as their favorite Dr. Seuss characters. . . . Thank you to everyone who brought in donations this week for Make-a-Wish. Our grand total was $2,183.80! We are very proud of our Fox Meadow family. . . . 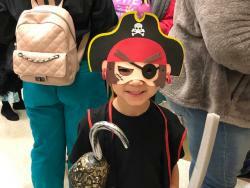 Thank you to everyone who came to our Princess and Pirate night! We had a blast playing princess and pirate themed games. . . .